Okay, so I’ve given up on the slate PC. Now, I’m not saying I’ve given up on the slate form factor. If you’ve read my previous posts you know that I believe it to be intuitively easy for people to just pick up and use. It’s not its intuitiven-ess that’s a problem, it’s the input method and the software that runs on it. The reason it’s not ready for prime time is a combination of factors, not any one thing. I intended to use the slate PC for several types of tasks: editing photographs, drawing, writing (specifically, blogging), and browsing. What I found is that of these tasks, only drawing was significantly enhanced by the stylus and slate combination. I don’t know if drawing was better just because I’ve been drawing with crayons and pencils since childhood. I tend not to think so as I’ve use the mouse for years drawing in Adobe Illustrator and in Photoshop. I can’t seem to get as good with the mouse as I am with a pen. This fact is obvious whenever I try and sign my name with the mouse. It just doesn’t work. Regarding the other tasks I mentioned, the stylus interface simply didn’t add anything new, or made the experience worse. In user interface terms, the stylus doesn’t sufficiently improve the input “bandwidth” beyond that of a mouse pointer: you are still controlling a single point on the screen and clicking on things. If you want to see a touch device that does increase this bandwidth, just take a look at Jeff Han’s work with multi-touch displays. Much better than a mouse, I’d say. Regarding photography, although I did see similar improvements as with the drawing tasks, the stylus point tended to obscure what was under it. When you’re doing touch-up work on someone’s face, you really need to see what’s under your cursor. Although better than a mouse at this task, the stylus interface paled in comparison to a (arguably) more conventional Wacom tablet. The Wacom tablet gives you the control but since its drawing surface isn’t the screen, you can see what you’re drawing. I classify all other interaction with a device as “interface manipulation” tasks. You are manipulating an interface when you’re clicking on buttons, which is the major activity in web browsing. The stylus interface sufficed, but again it wasn’t any better than a mouse. To be fair, I recognize the interface running on the slate PC was created for mouse-based interaction. However, that’s not an excuse you can give when you’re worried about usability issues. Perhaps a whole new interface could be created that is optimized for stylus usage (such as “crossing interfaces”), but that’s not really the point. The point is that the current windows, icons, menus, pointer experience (a.k.a. WIMP)) wasn’t any better with a stylus instead of a mouse. Until manufacturers find an economically feasible way to increase the input bandwidth beyond that of a mouse, I think they won’t find much success in pushing these new types of interfaces. Even allowing two fingers to operate a device concurrently is already proving to show great promise. For example, the two-finger scroll gesture on new Apple laptops is quite useful (I use it all the time without even thinking about it), and everyone’s ooh-ing and ahh-ing over the iPhone pinch maneuver. So, at the end of this little experiment, I came away with a $2k+ sketch pad. That’s cool, I guess. There's nothing that'll warm you heart more than spending New Years in a room full of cozy people. A joke I heard tonight: what do you get when you set a bomb off in a French kitchen? Linoleum blown apart. Ha ha. Goodbye 2006. Hello 2007. May we all be surprised at the success of our endeavours. Years ago, some time before the dot com crash, I went to a western saddle & tack conference in Denver to sell a web-based catalog service. Why we thought it was a brilliant idea to sell web services to a bunch of farmers… well, that’s another story. Anyway, around the second day a man—he ran a feed store, and looked to be in his sixties—got up the courage to visit our booth. He’d circled a few times, so I knew he was interested, but perhaps afraid of the “new-fangled” technology that we were demoing with. After delivering my pitch, I invited him to pick up the mouse and try it out. “Here, just point and click,” I said. He picked up the mouse and—to my utter surprise—held it in front of the screen. Of course, what happened when he clicked the button wasn’t at all what he was expecting. At the time, I couldn’t believe how lacking he was in basic computer literacy. After all, I lived in a world where mice were common things to have lying about the house. It’s taken me years of paying attention to user interface design to realize that what he did was not something to laugh at—it was exactly the right thing to do. People shouldn’t adapt to computers. Computers should adapt to people. It is this reason that slate computers have a better form factor for general computing. It’s not “new fangled”, it’s “old fangled”. In the last few days I’ve gathered some anecdotal evidence to support this statement. What’s the best way to find out if something is intuitively usable? That’s right, give it to someone who’s never used it before. If you’ve read my last post, you know that I’ve been waiting for a Motion LE1600 slate computer to arrive. Well, it’s finally here, a week late. Over this Thanksgiving holiday, I tested my hypothesis. If you pay close attention, you can hear Maychelle ask: “can you touch the marker?” I think she wanted to smudge it with her finger. I had to tell her no, but I kept thinking to myself that I should be able to answer “yes”. Think about it: all you’d need is an adaptive multi-touch sensor. In this case, you’d also have to pester Autodesk to upgrade SketchBook Pro. Total training time: 30 seconds. 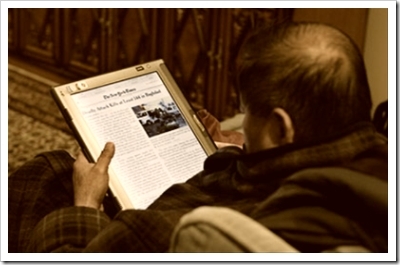 This is a photograph of my father reading the New York Times using their new reader software. I think he actually growled when I wrestled it away from him. Total training time: None. I just handed it to him. 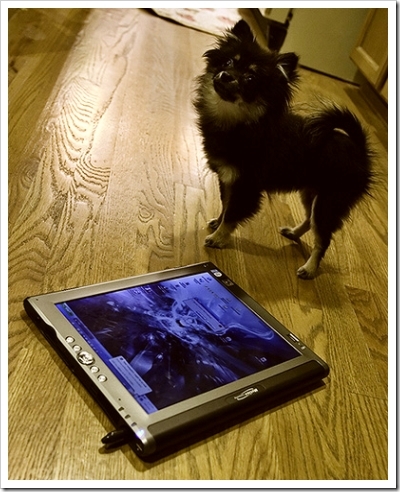 Pomeranians are well known to be intelligent dogs, so I thought, why not? She wasn’t able to manipulate the software on the tablet, most likely due to a lack of opposable thumbs to grip the stylus. Because this alone is not indicative of a failure to interact with the slate form factor (just the stylus), I have included it here. I will likely repeat the experiment when the aforementioned adaptive multi-touch sensor becomes widely available. Total training time: about 2 months. She can now sit and sorta lay down, but good luck trying to make her roll over. Of course, I’m cheating a bit here. The software used by my experiment’s human contingent were designed with slate computers in mind (and thus are wonderful examples of how pen-based software should work). Other software, including Windows XP and Outlook 2003, are nowhere near as slate friendly. However I am reservedly hopeful that this situation will improve. Perhaps one day I’ll be able to remember the incident at the saddle & tack conference in the same way my boss remembers her “rat tail” cell phone being too big for her pocket: as a possibility thankfully buried in the past. I’ve now been using Windows XP Tablet Edition long enough to form some useful opinions. Next time, I’ll go over why I think Microsoft is going in the wrong direction with their TIP interface, and discuss the tools I have discovered so far to increase productivity with a slate computer.